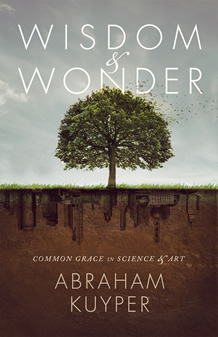 You may know that Kuyper wrote, in the early 1900s, a major, three-volume work on what the Reformed call “common grace.” These interesting pieces were actually attached as a bit of an appendix to that theological tome (which will itself someday be translated afresh; Wisdom and Wonder is perhaps the first fruits of this translation project, what Richard Mouw has called “a large dream come true.”) These do make an argument that God cares about daily life, and that human flourishing is a good thing (including the cultural activities of those who are not followers of Christ) and they focus specifically on how God’s good creation is formed in ways that invite sustained involvement in the arts and the sciences. I read an advance copy of this months ago, and, in fact, wrote a blurb or two for use on their promotional website. Given a few other irons we have in the fire here today, I just don’t have time to describe the whole book, but you should know that I could hardly be happier than to announce the availability of this historic release. I think what might be most helpful for our BookNotes fans, now, is just to cite some of the endorsing rave reviews the book has garnered already. and art. Highly needed and recommended. fearing or idolizing art and science. wonderful anthology. It’s just what we need. Neo-Calvinist authors who stand on the shoulders of Abraham Kuyper. creation order and redemption, and piety and cultural engagement. Well, you get the picture. Folks we know and trust (and whose books we adore) all exclaim how useful and important this mature work is. You should not take that lightly. These days there is much talk about evangelical Christians moving beyond old limitations and moralism to embrace a missional Kingdom vision of cultural engagement, transforming the principles and practices of our broken, needy world. We can rejoice that from all quarters we are reminded of our vocation to care for God’s world and to be salt and light in every area of life. But how in the world do we do that? How far will be get if we are not carefully attentive to God’s directing Word? Once we get beyond the rhetoric of being social restorers and agents of reconciliation, what do we do? What principles should guide us? Abraham Kuyper, limited only a bit by his own day and age, was a wise pioneer in thinking about common grace, Christ’s Lordship, and how to engage the worlds of the arts and the sciences. Here is real food for the journey, insights for cultural transformation, theology packed with implications for living out our vision of cultural witness, the meaty stuff we need for next steps in this day and age. What a blessing to have these remarkable insights made so readable, to inform us in this new moment of evangelical cultural engagement. Kuyper is often-cited in recent years but too few have actually read him. Thanks to those who published this volume, that can now be happily remedied. And we can indeed celebrate this for the wonderful way the translators adapted the 19th century prose into relevant, contemporary language and packaged it with a very artful design throughout. There is a very helpful forward by Jon Tyson and Gabe Lyon and a truly important introduction by a renowned black evangelical, Vincent Bacote, that are themselves very much a integral part of the text and will help give clues what to look for in the text. This truly is a lovely way to introduce readers to the depth and insight of the great Dutch statesman, itself full of wisdom and of wonder. Kudos to all involved!